SUWON, South Korea, Sept. 11 (Yonhap) — South Korea football coach Paulo Bento said Tuesday his side matched up evenly against a strong Chile team in a friendly at home. South Korea, ranked 57th in the latest FIFA rankings, held 12th-ranked Chile to a scoreless draw at Suwon World Cup Stadium in Suwon, south of Seoul. 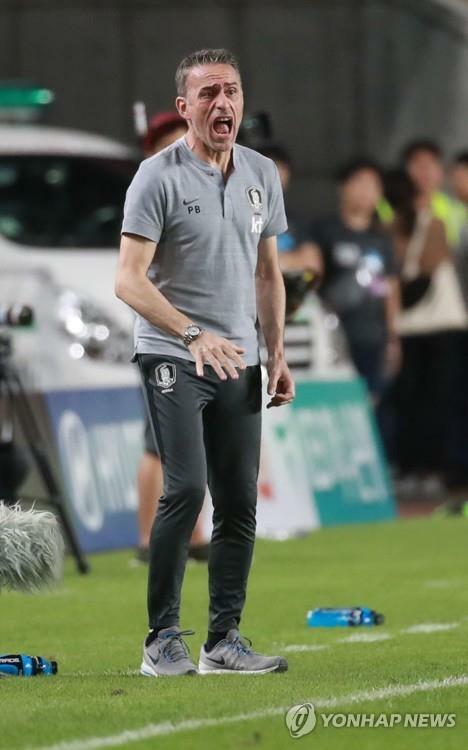 This was Bento’s second match with South Korea since taking the helm last month. Bento had a 2-0 win over Costa Rica in his debut last Friday. South Korea had a difficult time handling Chile’s high-pressing early in the game and made mistakes in the midfield. South Korea were able to create their chances in the latter stage of the game through set pieces and counterattacks, but failed to hit the net. South Korea surrendered an open chance to Arturo Vidal in the 63rd and nearly gave up a goal in the second-half stoppage time to Diego Valdes, whose close range effort flew over the empty net. Bento admitted that his side gave up the ball to the visitors in the buildup process, but claimed that they didn’t concede overly dangerous chances. But Bento also said he will fix problems that emerged from this match. Bento’s team will face Uruguay and Panama next month and are also scheduled to take on Australia and Uzbekistan to prepare for the Asian Football Confederation (AFC) Asian Cup in January 2019. Bento hinted at some roster changes. Bento said his brand of football is about creating as many chances as possible while playing at a fast tempo. The 49-year-old Portuguese said he will maintain that style and upgrade it. “We can play that kind of football because our players have that ability,” he said.